The first public performance of the RAAF Amberley band was on ANZAC day 1943, when the band led the annual ANZAC day parade through the streets of Ipswich. This occasion was the first of thousands of musical engagements undertaken by the band all over Queensland and New South Wales over the following 75 plus years. Over this period, the band has been through many high and just as many low points when, due to funding difficulties or a shortage of competent musicians, the band had been reduced to not much more than a handful of players and a drum corp. 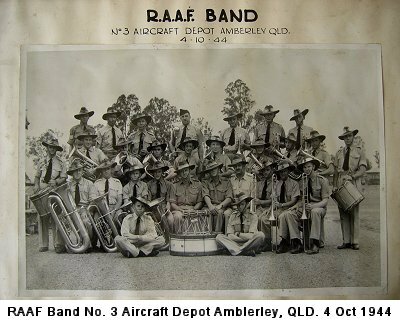 Prior to 1943, the predecessor to the RAAF Amberley Band was formed in 1941 by SGT Ted Selby and twenty eight bandsmen. Due to the outbreak of war in the Pacific, the first band folded in 1942. The band then re-formed in early 1943 with enthusiastic volunteers but no instruments. At this point Mr Bruno Ernst of the Laidley Town band came to the rescue and kindly donated a selection of brass instruments from the Laidley band to the RAAF Amberley band. Some of those donated instruments are still with the band today. The role of the band in the early years was to provide musical accompaniment for official occasions and ceremonial parades. As such, the band travelled all over Queensland and New South Wales in support of official military and associated civic functions. In 1954, the band played at Brisbane airport for the arrival of the Queen and the Duke of Edinburgh and a few years later played at a reception for Princess Alexandra. In 1962 the band flew to Townsville to play in support of a ceremony for the arrival of the first three Neptune Maritime aircraft to enter service with the RAAF. There were many more trips away for the band through to the 1970's such as Cairns, several trips to Townsville, Williamtown, and Tweed Heads, to mention a few. The band regularly performed at the opening of the Queensland Parliament and at the Ekka. In the late 1950's, the band gave radio recitals on ABC radio on Sunday afternoons. Of course the band has always been on hand to provide musical accompaniment on ANZAC days throughout SE Queensland and, when numbers have permitted, performed for Base parades. As a part time band with volunteer musicians, the issue of funding has always been a major issue for the band. A Brass or Military Band is not a cheap organisation to run, there is the purchase and repair of instruments, the purchase of contemporary musical scores and other ongoing expenses. In 1959 the Air Board recognised the contribution the Amberley band was making and allocated 10 Pounds per year to offset some of the costs. Then in 1962 a whopping £1036 was granted for the purchase of new instruments. On 24 April 1973, with the band under the direction of FSGT Jim Marriner, the band marked its 30th Anniversary and received national publicity when Channel Nine broadcast a 30 minute special entitled "Music, Marches and Memories - a tribute to the RAAF Amberley Band". Between 1973 and 2003 the band had several peaks and troughs, the troughs were in the main as a result of declining interest and the always devastating posting cycle. It seemed that just as the band was achieving a level of competence, the principal musicians would be posted. Through the 1980's the band was ably held together by its part time band master, SGT Barry Martin, who during his last posting to Amberley with the assistance of accomplished players, reinvigorated the band and maintained base parades, ceremonial occasions and kept up public performances when numbers permitted. The 1990's were a low point for the band due to an unprecedented number of postings early in the decade. The membership did not fully recover adequately to parade a full band and, as in the previous years, the band was reduced to a drum corps. The band continued however through the perseverance of FSGT Shane Flynn. In 2001, with the band at an all time low with respect to numbers, the decision was taken to open up the band membership to other than serving Air Force members. It did not take long to drum up interest amongst the wider Amberley community and to re-establish contact with former members. The Amberley Band was once again a vibrant entity and performing regularly. After over 75 years of history, the RAAF Amberley Band is once again a strong and viable musical entity. The band consists of serving members, retired Air Force and Army personnel, spouses and dependants of serving members and civilian members from the Amberley community. New uniforms have been designed and purchased and the band is once again regularly performing at official Air Force ceremonies, and in support of local community functions. As in 1943, the issue of funding has not dissipated. The band receives no direct funding from the Commonwealth and is predominantly self funding with the capacity to charge for performances which are not in direct support of official Air Force functions. In 2002 The Amberley Brass came under the musical direction of Mr Gary Lawrence who worked tirelessly in a voluntary capacity to arrange scores and select appropriate musical programs for rehearsal and performances. Under the musical direction of Gary, the band travelled to Norfolk Island in 2009 to perform across the Island in support of the annual Bounty Day celebrations. In 2010 the reigns were handed over to Mr Bryan Downey who led the musical development the band for six years. In 2014 the band travelled New Caledonia to provide musical support for the annual Bastille Day celebrations. In 2016 Mrs Linda Corcoran was appointed Musical Director of the band. Linda is now leading the band with a renewed vigour. The band currently consists of approximately 30 competent musicians and on average we perform two to three times per month throughout South East Queensland. Website built and maintained by Colin B Power. ABN: 89 752 331 076. This site Copyright RAAF Amberley Brass 2019.